Hello, I'm giving away a free eBook version of the copy of my book, "God's Inner Healing: A Guide in Life Recovery, Healing, and Mission" from this site. It's my way of my thanking God and you for visiting my site. Simply send me your name and email address to drsubida@gmail.com so I can send the pdf copy of the book to you via email. The book is one I regularly use in my teaching as a professor in the Asian seminary, my preaching and counseling ministries, my seminars/lectures, and global mission outreaches. It's available in local bookstores and has been and is being distributed in various nations of the world, such as USA, India, China, Thailand, Korea etc. If you wish to be part of the book's mission outreach to the nations, simply click the paypal "DONATE" button found in the lower part of the right side of this site and send your financial gifts to print copies of the book as give aways, especially for disadvantaged pastors, missionaries, churches, or wounded individuals and families. 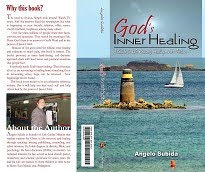 Or, you may simply contribute to the book's mission to the nations by purchasing it's ebook version from the U.S.-based publisher LULU -- click this link or go to http://www.lulu.com/content/e-book/gods-inner-healing-a-guide-in-life-recovery-healing-and-mission/4216134 for the online order system. If you wish delivery/shipping of the hard or paperback copies of the book to your address, or for bulk order discount inquiries, kindly send me an email of your request to : drsubida@gmail.com. FEEL free to call or text me also at 632-906-368-3020. I'd like to personally arrange the sending of the books to you if you request from this site. Cheers and may the Lord bless you always! The book, "God's Inner Healing: A Guide in Life Recovery, Healing, and Mission," is both a personal and ministry manual. It stems, for the most part, from biblical, psychological, and spiritual applications of God's Word on the healing of damaged emotions and inner selves. Because "I've been there" my self, the book contains portions of my own personal journey. So, this book is not just mere theory! “This book is dangerous. I've written it for I believe everybody needs it. At the same time, I've written it with some trepidation. The book deals with pain. It's a journey into our dark, hidden side. Despite of that, I believe its greatest gains shall be God's hope, healing, and happiness. I call it 'God’s inner healing.' I don’t know of a better way to describe a process that completely liberates people from life’s hurts, wounds and personal dysfunction. Medicine alone can never be complete for our healing. Psychiatry and psychology can’t be deep enough. Why are people haunted by hidden hurts for many years which debilitate them in their personal and public lives? How does one deal with this hidden dark side of the heart which saps power and effectiveness in life? This book is a series of brief, digestible chapters telling of the why and the how one can be healed by God and helped to grow toward wholeness. Here, I also attempted to address a frequently neglected area. Despite the proliferation of moral failures in the church over the centuries, very few people receive adequate instruction or assistance on this matter. The problem is like a “family secret” that no one wants to talk about. Likewise, it does not take long for us to realize that the church has not been serving as it should. There are always exceptions, of course. But in many places, the church and her leaders are the ones creating problems instead of serving as a healing, redemptive community. One said, “the church is the only army in the world that shoots its own wounded.” Because of this, a lot of people do not feel safe to go to or being in the church. They found reason to hide rather than heal within the Body of Christ. How does that relate to me in this book? Directly. You see, this book has been written from an insider’s perspective. I myself was controlled by hidden hurts for many more years than I’ve been healed and free. On top of that, I served as pastor and teacher in the church where I sought healing and support. And so, I present the essential contents of this book not just as theory, but personally experienced. Each person’s story is different from mine. Yet, the same. My own journey deals with some of the deepest issues of my life. So I felt it would have a great deal to say to our common humanity. Of course, I cannot make generalizations from my own particulars. I can only share my experience with you and trust God to lead you to the truth and blessing that He has in store for you. Everyone needs 'God’s Inner Healing.' All of us have something that we're healing or recovering from. The book directly confronts problems, which is often a painful process that most of us try to escape from. And this very act of escape leads to greater pain. It stunts emotional, mental, and spiritual growth. The book can be helpful to young people, adults, singles, or couples who want to heal from and be free of painful hurts, habits, and personal dysfunction that plague their present behavior and lives. The book is also for ministers, professionals, helpers, and all the rest of us who want to help others be healed and whole in the power of Jesus Christ. It can be a handy personal and ministry manual to lead people to face their truth and find freedom." 12 -- Where's The Bread? IF YOU FEEL LED BY THE LORD, YOU MAY SPONSOR OR GIVE COPIES OF THIS BOOK TO YOUR LOVED ONES, FRIENDS, CHURCHES, SCHOOLS, COMPANIES, ETC. WHO KNOWS? THEY TOO MAY BE LOOKING FOR NEEDED HELP AND ANSWERS IN THEIR LIVES AND YOU TOUCH A "HIDDEN MISSION FIELD."